Along with Sherlock Holmes and Robin Hood, Alexandre Dumas' "The Three Musketeers" has seen more adaptations based on their characters than can be counted on two pairs of hands. The quality ranges just like their literary counterparts, here from a late '40s gem starring Gene Kelly and Lana Turner to a, well, not-so-charming power-ballad-style picture from the '90s piloted by Keifer Sutherland and Charlie Sheen. 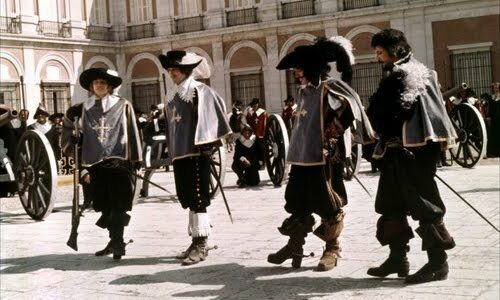 But, like most sources with an onslaught of cinematic variations, there's a real winner that shines from the bunch, and the one-two punch of The Three Musketeers and The Four Musketeers from Richard Lester easily stands out as the victor. They're entertainment in the purest of forms, conducted with a firecracker eye for the period, a rowdy sense of humor, vigorous yet humor-laced swashbuckling duels, and an ensemble that wraps it together into something special. Commonly known for his Superman sequels, Lester handles this take on the merry "all for one and one for all" band of lallygagging, gambling, rapier-slinging rogues with an attitude reminiscent of his work with the Beatles' films Help! and A Hard Day's Night. It becomes clear that we're working with what could've once been a framework set in place for the original British Invasion, complete with a hokey streak of slapstick humor and exaggerated performances, yet a more fluent cast fills their shoes and their bubbly attitudes. Micheal York heads the cast as the youthful musketeer-in-wait D'Artagnan, a role roughly two years prior to his career-defining turn in Logans Run, while the Musketeers themselves are handled by Thornbirds' star Richard Chamberlain as Aramis, the Oscar and Golden Globe-nominated Frank Finlay (Othello) in the shoes of Porthos, and an excellent Oliver Reed taking a break from horror films to give dark, brooding life to leader Athos. It turns out that using a slate of seasoned actors within an action-comedy framework originally intended for the Beatles is a recipe for charming tomfoolery. Lester's adaptation of Dumas' novel, stretched across both films, starts with D'Artagnan leaving his home -- and his father, after being bequeathed their family's sword -- to train in the ways of a musketeer. As he arrives in Paris, following his first fumbled confrontation with Count de Rochefort (Christopher Lee), circumstance lands him amid duels with the three musketeers at three hour-apart intervals within his first day in the city. 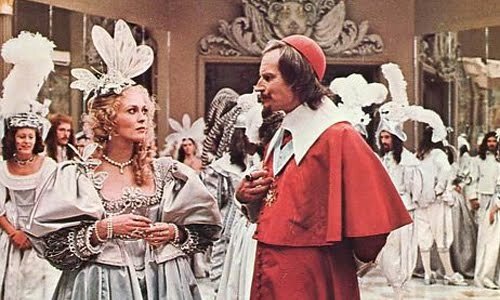 After their scuffle, which devolves into a clunky battle with the Cardinal Richelieu's soldiers, he finds lodging and stumbles upon the radiant wife to his landlord, Constance (Raquel Welch), who seems in haste to flee the house. It's there that we begin to see the plot's cornerstone begin to unfold, around the scheming underneath the king's throne conducted by the Cardinal (Charlton Heston) and the ownership of a set of diamonds by Anne of Austria (Geraldine Chaplin, Cria Cuervos), Queen Consort of France. This two-part film series adheres tightly to the construct of Alexandre Dumas' original novel, with the first half seeing more rambunctious swordplay while the second film, the more resolute and vigorously driven The Four Musketeers , focuses on more of the "dramatic" afterthoughts on the villainous scheming in the first half and a slurry of enthralling 11th hour combat in its resolution. Both, however, carry a sense of humor that align them as comedies, complete with blade spanks, toppling potatoes, characters' shirts getting trapped in giant waterwheels, broken beds after carnal naughtiness, and a lot of (fittingly) pointless shows of wealth from the loopy, animal-loving royalty. That concentrated level of absurdity normally rubs me the wrong way, but, under Richard Lester's capable hand and a stiff focus on its other merits, these scenes never fail to strike a true chord of amusement. Kicking a wall down with horse hooves and acid-encapsulated blades aside, it's completely possible to dig into the inanity and hold a stream of chuckles and grins throughout. Yet without the supporting cast, it's possible that Lester's Musketeers might've not had the buoyancy to carry across two pictures. On the villain's side of the coin, Charlton Heston takes the role of the manipulative kingly Cardinal, giving a muted performance compared to his more animated protagonist turns in The Omega Man and Soylent Green, while a lovely Faye Dunaway as Countess De Winter and a chameleon-like Christopher Lee melt into the film in a fashion guided away from their '73 namesakes, Chinatown and The Wicker Man respectably. Though all three go a shade underused, aside from Faye Dunaway's expected spike in screen time in The Four Musketeers , they all invigorate their scenes with fluctuating poise. You know, apart from for Raquel Welch, whose jaw-dropping allure simply mesmerizes amid Constance's goofy flirtatiousness. What's impressive about Lester's films is the way that the humor mixes with the rough-and-tumble swordplay, choreographed by William Hobbs. The Musketeer films represent Hobbs' earlier work, which cascades into a rich Hollywood lineage that pours into the likes of Ridley Scott's The Duellists down to into Ladyhawke and the '03 iteration of Dumas' The Count of Monte Cristo, and it's a lot of fun to witness his control over these sequences this early on. These aren't so much fencing battles, with lots of back-and-forth parries and stiff posturing, but animated street brawls that use swords in conjunction with at-times comical knees and punches. It'll all depend on the character; Reed's Athos scrambles and flails a bit like the Tazmanian Devil, while Chamberlain's Aramis tippy-toes and Micheal York's heroic D'Artagnan valiantly maneuvers. A handsome, expensive production from the father-son Salkind team of producers and Pierre Spengler spruce up The Three/Four Musketeers, arriving from the gentlemen behind the entire '70s Superman franchise. They embellish the French period with rich costume design and impressive set adornment, full of vivacious colors within choice architectural locales that keep our time-period suspension firmly locked. Velvety fabrics, rich colors, and intricate work offer attractions for the eyes, especially on the female cast members, executed to such a grand degree that The Four Musketeers garnered an Oscar nomination for its textile work. It's still clearly a "dated" production, but the merits within still hold charisma that's pretty stunning. Originally intended and shot to be one grand adventure at the cinema, both of Lester's Musketeers pictures amount to around 215 minutes -- close to three and a half hours. 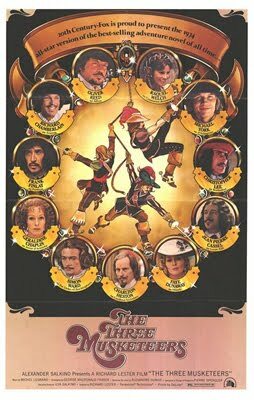 Partitioning the films into equal segments proves to be a wise endeavor, as there's a neat little dividing point in the center that, though seemingly anticlimactic when looking at The Three Musketeers as an individual film, works as an excellent placeholder for the next installment. That much scatterbrained, eccentric material would've simply been too much for one sitting, when the slapstick gimmicks repeat and the vivacious performances begin to strain on our patience. In this fashion, the separation occurs at just the right time, complete with a montage of upcoming footage to be included in the continuation. It whets the appetite and leaves us with just the right feeling: ah, this'll be fun for next time. Individually, however, they couldn't be a better time with Dumas' characters, slinging swords, and zingy Renaissance dialogue.